For the last two and a half months a snowbird has rented and occupied my Destin Pelican Beach Resort condo. They are checking out this weekend on the 14th. I hope they had a great time and tell all their friends. A very special family is checking in behind them. Kim Jetton has been battling cancer for the better part of a year and has finished chemo and surgery. She and her family are going to Destin to enjoy the Frazier's Pelican Beach condo in Destin. 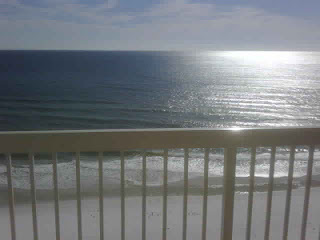 We have been telling them how beautiful the view is off the balcony looking out over the gulf. We remodeled this unit when we were down in October and put the final touches on it in December. I personally cannot wait until Kim walks in and sees how nice her new temporary home will be. Kim has been through so much and this is a small way to help her start to enjoy life again.